Not really one of the more popular families, the Mochocidas are an interesting addition to any aquaria. Most commonly seen in African Cichlid tanks fulfilling the role of scavengers. All the family members are found only in Africa, south of the Sahara desert. To view some statistics on many individual fish, just click on any picture. They are similar in shape to the Armored Catfishes, but they are scale-less with no boney plates. Synodontis grow to be quite large. They have a large Adipose fin with spiny dorsal and pectoral fins. Their face has three sets of pairs of barbels. The upper jaw pair are the longest, with the other two pairs being shorter and smooth. Most members are brightly colored when young, but tend to fade with age. 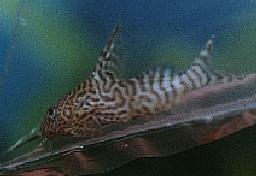 The Mochocidas are a hardy fish very active in their search for food. As I said they can become quite large so a big tank is in order. As the fish are twilight feeders the tank should have subdued lighting. Too much exposure to bright light, the fish will become shy and hardly be seen. The tank should be decorated with rock-caves or large driftwood and the substrate be of a fine texture. They require water with a higher pH than neutral and a high hardness (gH) level. The water temperature should not fall below 68f. In the wild the Mochocidas live in lagoons and other slow-flowing waters, often forming good sized groups. 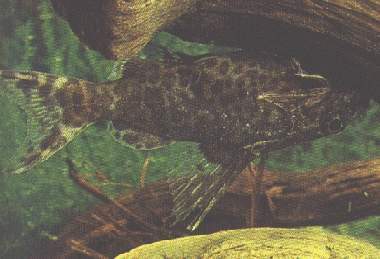 They are fish of the twilight and darkness and spend much of the day hidden under submerged tree trunks or river-banks. They are a nonaggressive fish, which will get along well with other fish, although they have a habbit of constantly touching the fish with their Barbels. All members live a long time. Very little is known of their breeding habbits.